SAS Makhanda (P1569), one of the South African Navy’s three serving offshore patrol vessels (OPVs), is currently deployed on a maritime fisheries protection tasking off Port Elizabeth. The converted strikecraft took up station off the Eastern Cape coastline at the weekend for a two week deployment as part of the national border protection tasking, Operation Corona. At the same time the ship, her crew and police and Department of Agriculture, Forestry and Fisheries (DAFF) personnel aboard will be acting in terms of the maritime resources protection component of Operation Phakisa, the national blue economy initiative. Makhanda is under the command of Commander PJ Ndimande and has completed one at sea night tasking as part of the overall mission plan. The remainder of the deployment will see the ship on patrol days and nights keeping a weather eye open for trawlers and other fishing craft making illegal use of maritime resources. While exact details of the deployment are tactical and not for public consumption, indications are Makhanda will first contact suspect vessels via radio. If this does not produce the right or no response, the patrol vessel will approach the suspect fishing vessel and hail it. If the right or no response is again forthcoming the suspect vessel will be boarded for inspection purposes. 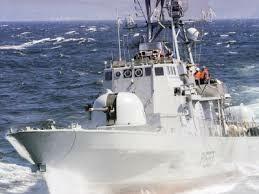 The OPV is not suitable for inshore patrols to counter mainly smuggling operations. This was undertaken twice last year by the Navy using Namacurra harbour patrol craft and working alongside other national defence force elements from the air force and army as well as police and fisheries inspectors. The maritime service of the SA National Defence Force (SANDF) was tasked with maritime resource protection in May and November last year in the Gansbaai area. The November deployment saw over R90 000 worth of illegally harvested abalone and diving gear and equipment worth over a quarter of a million rand confiscated. At the time of publication Makhanda had not encountered any suspect vessels.